FORD FOCUS ST 2016, BLEU, SEULEMENT 13 799 KM, MANUELLE, GROUPE ÉLECTRIQUE, GPS, TOIT OUVRANT, SIÈGE EN CUIR CHAUFFANT, CAMÉRA DE RECUL, MAGS, BLUETHOOT ET BIEN PLUS ENCORE! POUR SEULEMENT 96.90$/ SEMAINE SANS AUCUN COMPTANT CETTE VOITURE SPORT EST À VOUS. 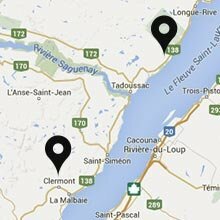 NE TARDEZ PAS ET PASSER CHEZ CLERMONT CHRYSLER POUR EN FAIRE L'ESSAI AUPRÈS D'UN DE NOS CONSEILLERS. Ce véhicule, Ford Focus ST * GPS vous intéresse?